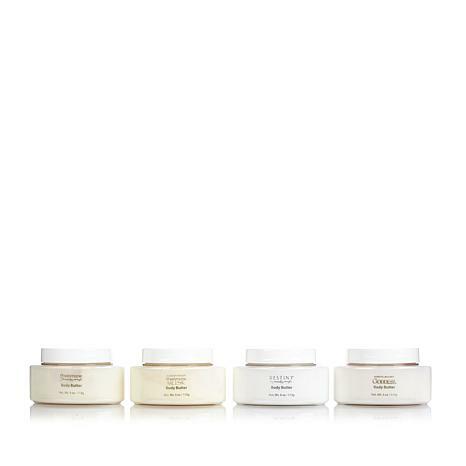 Enjoy the rich indulgence of Marilyn Miglin body butters with this 4-piece collection. An assortment of fragrances let you choose the perfect scent to match your mood, while the luscious formulas leave your skin feeling soft, smooth and sensuous. Pamper your senses in the most beautiful way. Ingredients: Water, Mineral Oil, Shea Butter, Cetyl Alcohol, Stearic Acid, Caprylic Capric Triglyceride, Glyceryl Stearate/Peg 100 Stearate, Beeswax, Triethanolamine, Sodium Laureth Sulfate, Fragrance, Aloe Barbadensis, Carbomer, Methylparaben, Imidazolidinyl Urea, Propylparaben. May contain: Yellow 5, Yellow 6, Red 40. Love Marilyn's products, especially Pheromone. I believe the fragrance was the first item I ordered from HSN over 20 years ago. 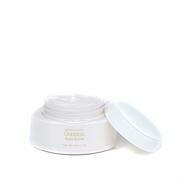 The cream is a good solution to dry skin and gives out a good feeling. This set gives you a sampling of Marilyn's fragrances. I wish the formulas were not mineral oil based because the texture of the creams is not as luxurious as others. The scent of each does not last long either. Should be reformulated. Have to return these items the smellis not to my liking. Scents smell strangeto me.